When I was a teenager I used to go to the Christian bookstore with my mom. Why would an adolescent boy hang out with his mother? I was depressed and struggling to find my way in high school. I was longing for more of God and she was helping me to find my way. One day at the bookstore I came across The Imitation of Christ. The cover of the book had the dark outline of a young man (who I assumed was the author) coming out of the shadows and approaching a lighted cross. His body was dark. There was a glimmer of light from the cross that shined on his face. In my mind I saw a young man that looked depressed, but earnest in his pursuit of Christ. That’s me! I thought as I held the book. I felt like I was looking in a mirror. My mom bought the book for me. It’s a gift that’s still blessing me over thirty years later! The author was Thomas à Kempis. I didn’t know that his book, The Imitation of Christ, written in 1486 just after his death was considered the greatest of all the classics of Christian devotion and that it had sold more copies than any other book except the Bible. I didn’t know anything about him except that he was a monk and frankly that scared me! (As a young Protestant Christian in the 1970’s I wasn’t sure that Catholics were okay to learn from.) But at the same time it fascinated me that as a monk he was so devoted to Jesus that it was like he was spiritually married to him! I knew that his book was for me. It was like a lifeline from God sent down to me in my dark pit. I began to read The Imitation of Christ day after day. I read every word. I prayed all the prayers. I listened intently to the words that God spoke to the author. I began to copy the author. I got on my knees and poured out my heart to God and then I listened. I wrote my own psalm prayers from my heart to God like he did. I listened to God like he did. Then I wrote down what I sensed God was saying to me, just like he did. Over time as I read The Imitation of Christ fire kindled in my heart and began to consume me. 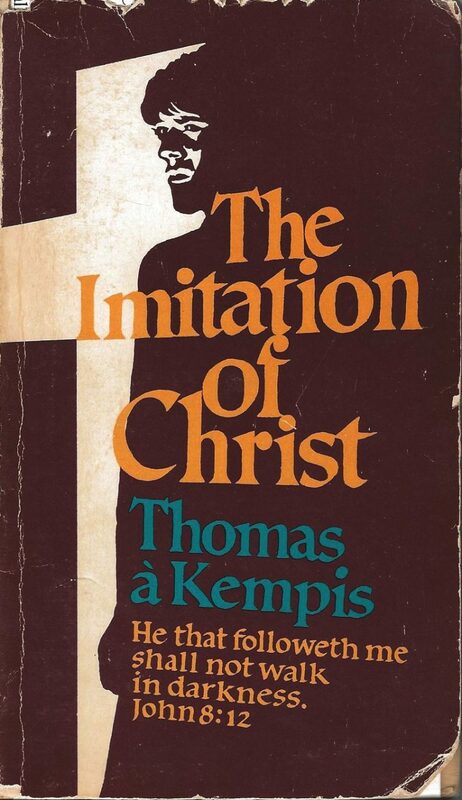 I wanted to imitate Christ like Thomas a Kempis! I knew that my life was forever changed! I knew that God had called me to awaken other people’s hearts for God and that one day I would be a devotional writer like him. That was over thirty years ago. I’m still reading, praying, and living The Imitation of Christ. I’d like to share with you a meditation I wrote that’s based on a few paragraphs from this classic. May it inspire you, as it’s inspired me, to seek the Lord Jesus Christ as the One for you. Happy is the person who is taught personally and directly by the One who is the way, the truth, and the life. He comes from the Father. His words, His Spirit are true. Oh, what grievous folly it is to neglect this One who is most precious and profitable, the only One who is necessary, and to give our minds to things with are curious or hurtful. Our hearts become diverted, then captivated by lesser things or bad things. We have eyes, but don’t see; ears, but don’t hear. Truly all things are from One; all things speak of Him; He is the Word, the Beginning which speaks to us. Without Him no one rightly understands or judges. The person for whom all things are about the One, who brings all things to the One, who sees all things in the One, this person is able to remain steadfast of spirit and at rest. O Three-in-One, who is the Truth, make me one with You in everlasting love. Often it wearies me to read and listen to many things, even many good things. In You alone is all I that hope for, all that I desire. Let all the doctors, teachers, and consultants hold their peace before the One. Let all creation keep silent before the One. I cry out to You, my One and Only, speak to me! Yes, there is but One Word for me. Just One. Jesus. Of all the things I’ve written, “A Love Letter to Jesus” is one of my favorites. It also is inspired by a chapter in The Imitation of Christ.